Recently, copper has been evolving as one of the happening home décor elements and is being utilized by many interior designers to give homes an enriching look and feel. If you want to create a rustic essence in your 3 BHK flat in South Kolkata, then opt for copper accents to indulge in the charms of the age-old era. Give, your space a significant vintage vibe with this element that can quickly add warmth and elegance to your interiors. Let’s look at the interesting ways in which you can add copper to your home. Glorify your bedroom by adding a stunning copper plank wall behind the bed and create an exquisite interior design in your new flat in South Kolkata. Imbue a rustic yet modern décor in your bedroom with this plank wall, highlighting the energy in your home. 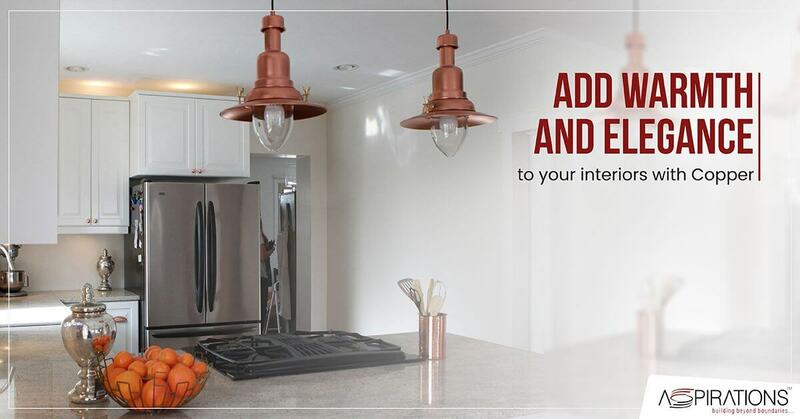 This rose-gold element with undertones of orange can be the perfect holder for pendant lights, which you can fix in your living room or dining hall. Create the perfect spot for couching with these statement-making light hangings where you can sit comfortably on your sofa and read your favourite novella or, just sit and have a relaxing conversation with your family members. You can also place these copper pendant lights in your dining room above the dining table, giving the room a restaurant like feeling. Place copper plates on the dining table to make a palatial statement. Add greeneries to your home to make it look vibrant and aesthetically pleasing. Copper pots are an excellent idea to place all your indoor plants. Invest in different shapes of planters like square and round, and keep them in one corner of the room or put them up on shelves to add charm to your 3 BHK flat in South Kolkata. Place copper planters with photo frames, books, or curios in a wooden shelf and keep the set up in one corner of the room against a wall to make your space look interesting. Highlight an accent wall in your hall room with copper frames, pudding molds with different motifs, mirrors with copper frames and tribal signs like a copper arrow. You can hang copper masks of animals like an elephant or a lion, which will be the focal point and place frames or small curios alongside it. Another simple way of doing your accent wall is by placing copper plates with small mirrors to create a game of light and reflections in your living room. This will make your room look brighter and bigger. White background works best with accent walls. Do not place copper elements on a dark or wallpaper background. Then you will lose the focus from the actual details. Glam up your kitchen by adding a drop-in copper sink and the monotonous combination of the black and white kitchen. Also, an added advantage of adding a copper sink instead of its stainless steel counterpart is that copper possesses anti-microbial properties. It is a better choice for those who wash their vegetables and fruits in the sink. Indulge in white marble countertops with a copper tap for the sink. So, it’s time to revamp your 3 BHK flat in South Kolkata and add a touch of copper to it to bring about elegance and luxury. If you found this blog helpful, keep watching this space for more such interior decoration ideas by the Aspirations Group.